lauren woods talks about her art installation, American MONUMENT, on display at the University Art Museum in Long Beach, Sunday, September 16, 2018. Photo by Kelly Smiley. University Art Museum Director Kimberli Meyer was at her desk drafting opening remarks for the launch of American MONUMENT—an installation examining police killings of black civilians by artist lauren woods that was meant to mark a shift in museum programming—when she was abruptly fired. On Sunday, a few days after Meyer received the news, woods staged a protest on the opening night of the exhibit, effectively silencing its central sound installation and pausing production of American MONUMENT until the university hears an appeal of Meyer’s termination. 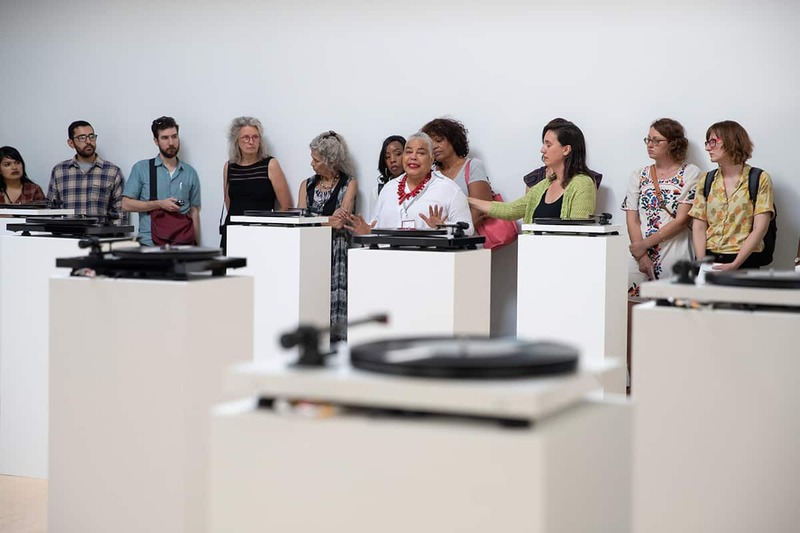 Consisting of a grid of spinning acetate records that play language based on narratives found in open records request materials, American MONUMENT was a first for the on-campus museum. It was meant to represent the kinds of structural and institutional changes personally spearheaded by the progressive Meyer over the past two years. As the first iteration of the piece, the exhibit was set to travel to different sites and grow as more cases become available through public records requests. The university generally does not comment on terminations due to privacy restrictions. 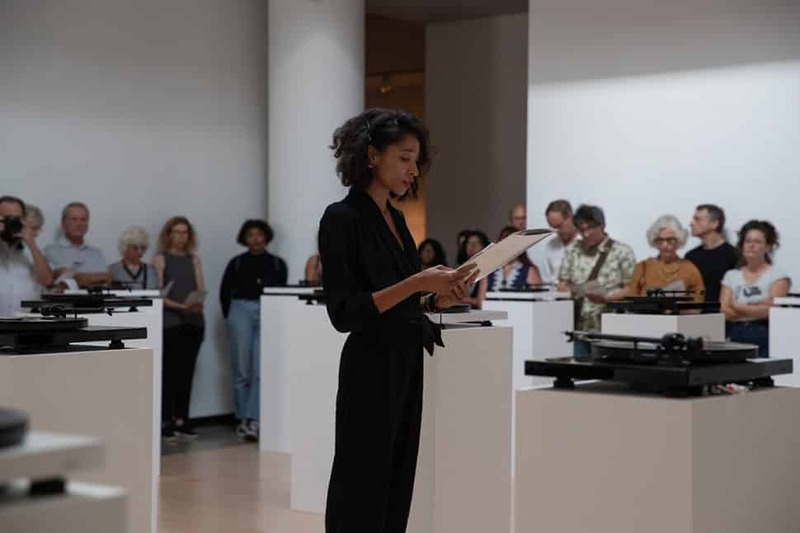 woods protested Meyer’s unexpected termination during the opening of her exhibition Sunday, with a pre-arranged show of participants walking down the rows of turntables and, in an almost ceremonial manner, switching each player off. Tension hung in the silence that followed as woods walked off the platform and out of the gallery. Some attendees applauded; others left. The record players have thus far been turned off and the records removed. woods said a copy of the full letter marking the pause will be left at the museum for visitors to read. The full statement can also be read via the link here. Prior to woods’ unexpected protest and the unveiling of MONUMENT, Parker-Jeannette spoke at the launch that she was proud of the museum for taking on challenging and timely topics. Artist lauren woods walks out of American MONUMENT at the University Art Museum.